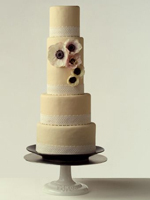 Joconde cake filled with vanilla cream and hibiscus bavarois, covered with white fondant and decorated with vintage lace, strawberry blossoms, ranunculus, begonias and geraniums. 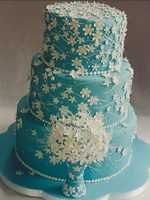 A beautiful blue cake with delicate white detail. Stylish sweets by Pastry Chef Lisa Raffael. 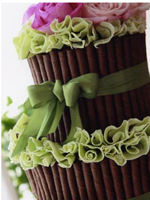 A variety of beautiful cakes made with only the finest ingredients. Bittersweet chocolate and key lime coconut are two favorite selections. 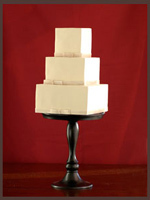 A tall browned butter cake with vanilla buttercream. 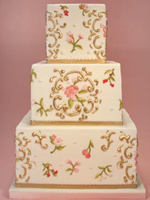 Moist cake, rich buttercream and sweet sugar dough in a china pattern designed creation. 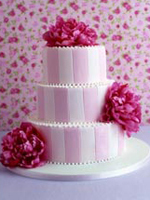 Another sweet pink cake from Peggy Porschen. 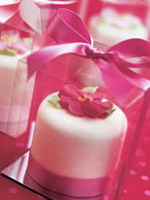 Sweet pink mini cakes, boxed as individual favors. 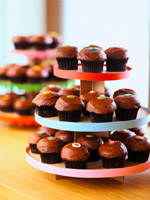 Baked from scratch daily in San Fransisco, Kara's Cupcakes puts a sophisticated twist on an old favorite. This posh patisserie in Austin, Texas specializes in desserts, wedding cakes and made-to-order desserts. 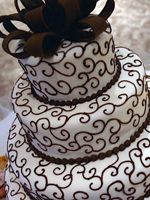 This Cleveland-based bakery makes wedding cakes with fine ingredients and fabulous decorations. 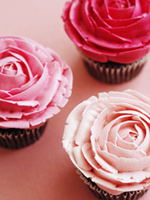 Buttercream or fondant? 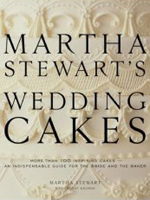 Martha will answer this and so much more in Martha Stewart's Wedding Cakes. 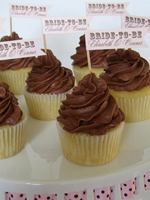 The Cupcake Shoppe, located in Toronto, offers 17 delicious cupcake flavors, which are baked daily and iced beautifully. 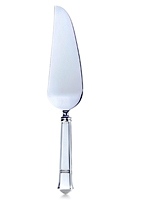 The Tiffany Windham Cake Server is sterling silver and oh-so-lovely. $170 at Tiffany and Co. Choose from a variety of styles, colors, and papers to create your own festive cupcake flags. 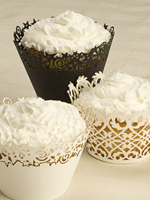 Check out these gorgeous die-cut cupcake wrappers. 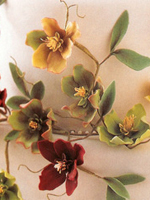 These hellebore flowers and leaves are created by hand, petal by petal. 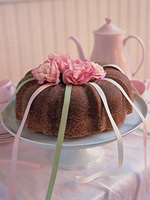 Have your baker use them to create a pretty cake like this gorgeous Martha Stewart creation. 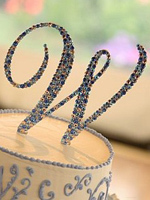 Sari Watkins creates beautiful crystal covered monogram cake toppers. You can choose from a wide variety of fonts and colors. 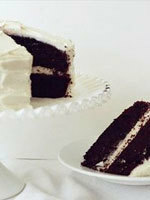 Choose to frost this moist chocolate cake in buttercream, chocolate, cream cheese, peanut butter, or moocha. Perfect for a bridal shower! 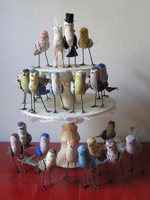 Ann Wood recently completed this special order of birds: bride, groom, attendants and honored guests. 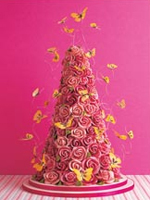 Styled to look like a traditional french croquembouche, this pretty pink rose cake has butterflies in flight all around it. 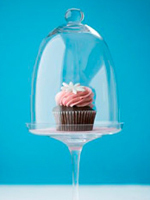 Individual cupcakes designed by Sonya Hong are certain to delight your guests! 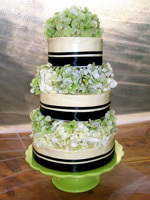 Green hydrangeas and black trim decorate this stylish cake. 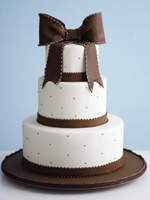 Pretty ribbons and teeny polka dots with a stiched bow on top. Just so charming. These little cakes have layers of chewy chocolate brownie, rich swiss chocolate cake and creamy peanut butter cream cheese filling. 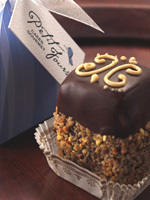 All smothered with a sleek dark chocolate ganache and chopped peanuts. 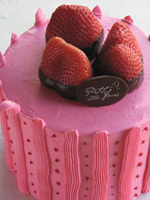 Fresh sweet strawberry and yellow sponge cakes layered between a strawberry mousse. Topped with chocolate dipped strawberries. 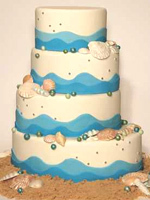 A little twist on a simple cake makes a fun destination wedding style. Almond pound cake with milk chocolate and caramel crunch filling. 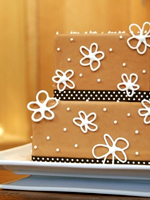 Covered in caramel buttercream adorned by sophisticated sugar bows. Yum. 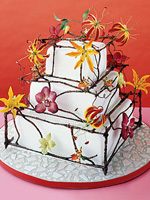 Grapevines, lilies, and orchids decorate this rolled fondant cake from Cake Crumbs. 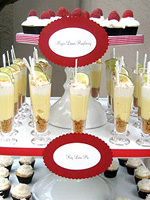 Inspired by her mom's homemade cakes and sweets, but with a contemporary twist, Amy Berman makes delicious wedding goodies like this delightful selection of sweets. 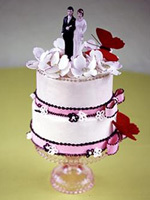 Bright red butterflies nestle in a bouquet of pastillage dogwood flowers all atop a white cake with pink sugar paste ribbon with black & white detailing. 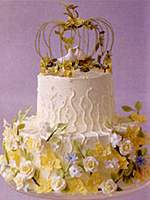 Master sugar artist Jan Kish makes the most magical cakes. Cake designer Gail Watson has put together some amazing kits for savvy bakers. 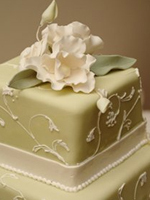 You bake the cake and Gail will provide you with all the adornments to make it perfectly professional. 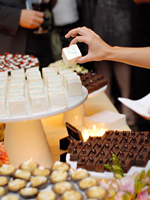 They say you'll fall just a little in love when you taste these decadent petits fours. 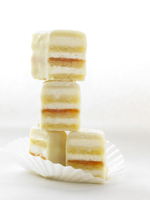 Three layers of moist cake with thin layers of marzipan available in raspberry, lemon, apricot, vanilla-orange, hazelnut praline, and chocolate. A lovely tradition at a shower, each guest pulls a ribbon from a charm cake to find a small charm dangling from the other end. Each charm has a special meaning and foretells luck, romance, or good fortune. 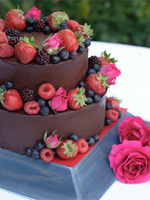 This decadent chocolate and berries cake was made by pastry designer Erica Holt. 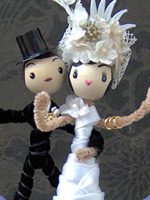 These custom created cake toppers are perfectly adorable. 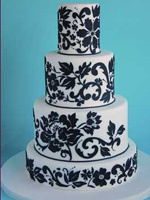 A fashionable black and white Parisian style cake created using an applique technique. Jin Patisserie makes the most amazing desserts. 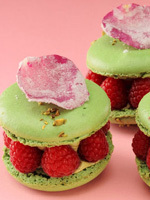 Serve these pistachio macarons instead of the traditional wedding cake or wrap them up as sweet and unique favors. 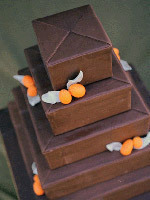 This modern chocolate cake was designed to have the look of rich, folded leather. If you live in the Los Angeles area, you're in luck. 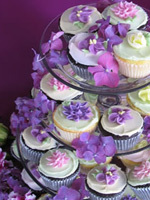 Sprinkles Cupcakes will deliver cupcakes for your wedding--you choose among the many delicious flavors. Red velvet, strawberry, vanilla, chai, carrot, and banana are just a few of the delicious flavor choices. 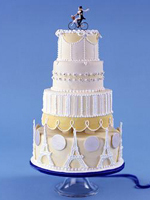 A perfectly Parisian cake with summery yellow fondant and white icing, topped with a bicycle built for two. Created by Kate Sullivan at Lovin Sullivan Cakes. Everything at D. Sharp Studio is handcrafted and wonderfully exquisite. 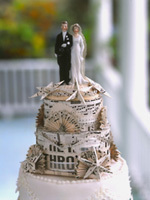 This Paramount Cake Finial--with a dapper couple on top--is created from vintage sheet music and organza ribbon. 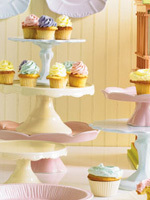 Stack cupcakes, favors, or individual cakes on these fanciful pastel cake stands.